Building up and maintaining soil fertility is one of the most cost-effective investments than can be made in a grazing enterprise. Not only are many Australian soils inherently low in nutrients, these nutrients are constantly removed in animal products (meat and wool) as well as in hay, silage or crops. Laboratory soil tests, plant tissue tests and the use of fertiliser test strips can all assist in making sure that the right amount of the correct fertiliser is being applied to meet your pasture growth objectives. Use the tools in this module to determine appropriate capital and maintenance fertiliser rates to address soil nutrient deficiencies. The decisions relating to fertiliser application (such as the type that most suits your operation and the rates you might use) are essentially about pasture growth and maximising profit, and are dealt with in this module. Tool 6.4 in Healthy Soils contains instructions for collecting soil samples for laboratory testing. Identifying soil health problems, and assessing the need for remedial action or special management are addressed in procedures 6.3 and 6.4 in Healthy Soils. Poor soil nutrient availability contributes to low pasture growth, low levels of desirable grasses and legumes and poor feed quality across most of the high-rainfall and wheat–sheep zones of Australia. Plant tissue tests are more effective than soil tests if trace elements are limiting pasture growth. Trace elements include molybdenum, copper, zinc and boron. Experienced local farmers, agronomists or veterinarians will know if trace element deficiencies are likely in your district. If you wish to assess the trace element requirements for pasture growth, take a sample of the most dominant clover in the paddock during spring and submit samples to a reputable laboratory (see signposts). You will need to contact the laboratory to get the correct sampling technique for the trace element you are testing for. Do it yourself, using fertiliser test strips. You can directly assess the likely response from fertiliser applications by laying out test strips in your paddock(s). Test strips can be used for any fertiliser type and are particularly suited to situations where there is not a satisfactory laboratory test (eg, for N, trace elements or gypsum), where deficiency symptoms are not highly characteristic, or where you want to test non-traditional fertilisers. Use tool 7.2 to set up and monitor your own fertiliser test strip. Figure 7.2. The effect of fertiliser on average monthly growth rates at Hamilton, Western Victoria (winter rainfall area) and Orange, Central Tablelands NSW (uniform rainfall area). Hamilton data simulated from GrassGro; Orange data from NSW PROGRAZE®. Two examples of how much extra pasture can be grown, when nutrient deficiencies are corrected, are shown in figure 7.2 for an introduced pasture at Hamilton (Vic) and a native pasture at Orange (NSW). Native pastures containing some legume (eg, sub clover, cluster clover, medics) will respond to low rates of phosphorus (P) fertiliser. However, native species can decline under competition from clover, annual grasses or broadleaf weeds if fertility levels are raised and the additional feed not utilised. For native pastures, about 20% legume content in spring is the recommended maximum level. For native grass pastures in high conservation areas or where an increase in native species diversity is desired, do not apply fertiliser or legume seed as both will reduce the conservation value. Introduced (also called exotic or improved) pasture species have a higher requirement for nutrients than native grasses so fertilising paddocks with these species will give a bigger response. Generally, it is the legume component of the pasture which gives the immediate production and feed quality response to P fertilisers such as superphosphate if there are no other limiting factors such as acid soil. 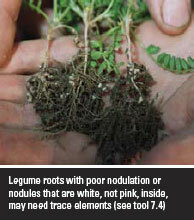 The legumes fix N, which becomes available to the grasses when the legume roots die off. We usually rely on legumes to supply N to the grasses in the pasture, but applying N fertiliser to supply additional N is economical in some situations. Review the guidelines for the use of N in tool 7.4 to assess whether N fertiliser will be profitable for your sheep enterprise. Ensure the proposed nutrients do not adversely impact on the environment. Given the prevailing conditions in a paddock, eg, proximity to drainage lines, amount of bare ground, etc, nutrients may be easily lost to erosion or leaching beyond the root zone. Use tool 7.4 to quickly assess any potential nutrient losses. The economic benefit of correcting nutrient deficiencies was evaluated by more than 100 producers (in Vic, NSW, Tas and SA) who participated in the Grasslands Productivity Program (GPP) from 1993 to 1997 (table 7.1). Pasture types ranged from improved perennial to annual to native. The average return was $1.89 for every dollar spent on fertiliser and livestock. Table 7.1 The economic benefit of correcting nutrient deficiencies, for producers who participated in the Grassland Productivity Project (GPP) from 1993 – 1997. Source: Grassland’s Productivity Program - final report to members (1998) prepared by J. Court. The Grasslands Society of Southern Australia. Soil Analysis, an interpretation manual (1999). Edited by K.J. Peverill, L.A. Sparrow and D.J. Reuter (CSIRO Publishing: Collingwood). Go to http://www.publish.csiro.au and use the search function. Plant Analysis, an interpretation manual (1997) Second Edition, edited by D.Reuter and J.B Robinson (CSIRO Publishing). Go to http://www.publish.csiro.au and use the search function.